The movie follows Lt. Jo, who takes joy in taking bribes and turning a blind eye to corruption. When an explosion occurs, however, the corrupt cop becomes the prime suspect and embroiled in a conspiracy involving a multinational conglomerate. Director Lee, about to release his first feature-length film in five years, said that Lee’s acting was crucial in carrying the drama, as the protagonist is an extremely emotional character with dramatic highs and lows. Pushing him to the limit is Gwon Tae-ju, a right-hand man of an “the biggest evil in Korea” played by Park Hae-joon. The director said that he thought that Park’s handsome face has a “beast-like, violent side” that erupts when met with Lee. Park said that he was neck-deep in the role that he failed to even notice a bruise near his ear, perhaps an hint of the “beast” the director talked about. “It was hard, physically. I’ve prepared a lot, trained a lot, but they always required more,” he said. 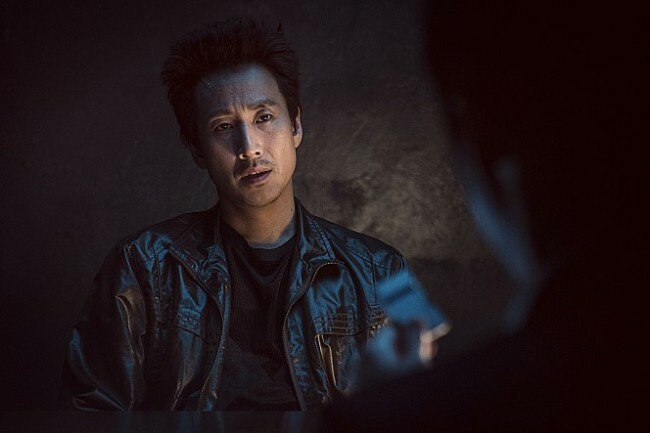 It seems that Lee Jeong-beom’s trademark style of a flawed man going through hardship and spiritual growth throughout the film -- most notably in his most successful film “The Man from Nowhere” -- will also be found in this flick. The “Jo Pil-ho: The Dawning Rage” opens on March 21. * Official English title of the film has been changed by its distributor from "Bad lieutenant."